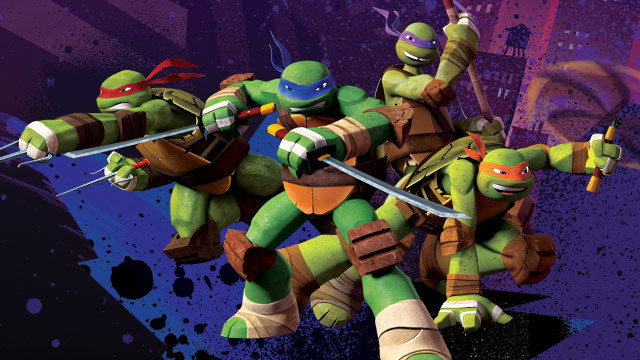 This past weekend the heroes in the half shell returned to airwaves in a new cartoon for Nickelodeon. Since it’s artwork first debuted and discussions of the show hit the net lots of people were concerned. Are those concerns justified, or are the Turtles back? Being the 26 year old that I am, growing up revolved around two things in my life, the Transformers and the Teenage Mutant Ninja Turtles. I had all the toys, the technodrome, even the more obscure ones that mutated or had manhole covers on their back with rip cords that made them talk. I watched the classic cartoon, went to all the movies, and as I grew up my love for these characters never died. Anytime they returned I watched their product whether it was great or as ugly as the Coming Out of Our Shell Tour, so in these modern times when a new cartoon was announced I was looking forward to seeing how the Turtles would be represented to today’s youth. They are four characters that really can fit inside any generation, they don’t get stale, they won’t be looked down on compared to today’s other animated offerings. They can be just as awesome as they were back in the 80s and90s. Now I will be honest the animation style had me a little concerned, and some of the initial clips were not the best, but I was ready to give this show a chance when it debuted Saturday morning. Lets break it down. First, lets start with the original back when I was growing up. The theme screams 80s, with cheesy lyrics, quick one liners from the characters, and flashy intro with lasers and a span over all of the main characters. Still when that theme hit as a kid you were pumped, you knew you were in for an awesome cartoon show no matter how silly it sounds today when it comes to intros and themes for toons this one is iconic and stands out. Next I wanna focus on the theme from the fox series, which is the next toon I felt was successful in recreating the Turtles. For me, this one just didn’t click. It’s not terrible, but I felt the intro (even though it’s just over a minute) dragged on. It doesn’t give you the same feeling as the theme for the classic toon. The show itself however was really good. It brought the Turtles back to mainstream and also gave them a small amount of edge. I will never forget watching the episode where they took on Shredder and decapitated him.. ON A SATURDAY MORNING CARTOON! It was wild, even if his body did just walk over later and pick it up it was still nuts. Now lets hear the latest creation. A lot of people initially groan when cartoons get rap themes, but I felt this fit the new show. It’s not trying to sound thug, the small bit of orchestral music in the background is catchy, and they include some classic lines from the original theme. It’s not perfect, and it drags a bit, but overall I am very pleased. This is something that like the original can get kids excited for what they are about to watch. The origin for the new series is quite similar to the classic show with only minor changes. In the 80s the Turtles were bought by a kid in a pet shop and dropped down a drain where they came in contact with the ooze that turned them into their humanoid forms and turned Splinter from man to rat. This time Splinter is the one who bought them from the shop and in an attempt to stop an alley way crime the mysterious men he is fighting end up dousing him in the ooze along with the turtles and the rest is history. Splinter is still Hamato Yoshi and his rival is still Oroku Saki. Their rivalry is still born over the common love of a woman who dies in the midst of their combat. The only other noticeable change is making April O’Neal a teenager around the same age as the Turtles who has a scientist father. The attitudes for the four brothers are all what you remember with Leonardo being the always obeying leader, Raphael being the one with the attitude, Donatello is the brains, and Michelangelo is the goof. All in all it’s pretty faithful with no huge leaps or changes. The chemistry between the four heroes is spot on and the introduction of each of them via combat training is an excellent opening to introduce them and their personalities. The humor in this show, while garnered towards kids, is still well executed and can even be appealing to the older fans watching because it fits each of the characters. You find yourself still chuckling at it because you know it’s something Leo/Don/Raph/Mikey would say or do. Even Splinter gets his one or two moments for the show to execute humor. The action is well animated and easy to keep up with, it doesn’t get too boring, plus it helps that during the fighting they are still quipping at the enemies and each other. I also liked seeing their progression as a team. This show doesn’t start off with them already established or knowing the city. Hell they start off having never been to the surface yet. It was a fresh idea seeing them experience the outside world, see how they were never trained to work as a team, and their first encounter with pizza is hilarious. The pacing of the episode (they called it two episodes but you could see it was all pieced together as one hour long event) was well done and never stalled, concluding at a good stopping point that gives you an idea on where they are heading for the season as a whole. This one may be small, and the things I have are a tad nitpicky, so they are not tremendous things break the show entirely. I am not 100% convinced on the voices, mainly the one for Michelangelo, as it’s high pitched and very raspy. He does have the surfer bro/dude accent but just the way it sounds doesn’t work for me at times. I also felt some of the small plot points were weird (POSSIBLE SPOILERS) such as Donatello developing a crush on April, leaving that the sole reason why they make their inital attempt to save her. Makes you wonder what will happen when/if Casey Jones is introduced. I also was a bit mixed on Krang no longer being a single character, but an entire race. They are almost like one minded brain monsters who just call each other Krang. The animation does bother me a tiny bit, but it’s not the character animation. I am not a fan of the background animation as it just looks flat compared to the characters. It almost feels like they are all 3D and their environments are cardboard cut outs. Nickelodeon as put together a superb product that will capture the interest of both kids and older fans alike. It never becomes too corny or dumb down and displays a level of writing that is rarely seen in cartoons today. These guys and girls get the Ninja Turtles and have set up a level of excitement that makes me eager to see what is next. I have a feeling this incarnation is going to be around for a while as toys are flying off the shelves and a 2nd season was already ordered after pulling in 3.9 Million viewers and the highest rating in the boys 2 – 11 year old demographic that Nick has seen all year. The Teenage Mutant Ninja Turtles are back and any concerns with the content of the show or anything else should be washed away. If you were a fan of any period in this foursome’s history check this show out. My roommate is obsessed with the TMNT. Favorite movie of the 3? I would have to go with the first film. It blends the comic and the cartoon together really well and still holds up as a decent film to watch.